Two Ladies at breakfast in their dressing room. Home » Two Ladies at breakfast in their dressing room. Morning dresses. November 1794. The Gallery of Fashion. Published by Nikolaus von Heideloff, London. HEAD-DRESS. A French night cap, the cawl of worked muslin, with a double border aflame in half plaits; round the head, a broad striped riband quilled. with a large bow behind, and in the front. The peignoir, or loose jacket and petticoat of checker muslin, with a very broad hem, and the trimming of plain muslin, scalloped. Large muslin handkerchief within the peignoir. A narrow riband tied round the waist. White mules, or slippers. HEAD-DRESS. 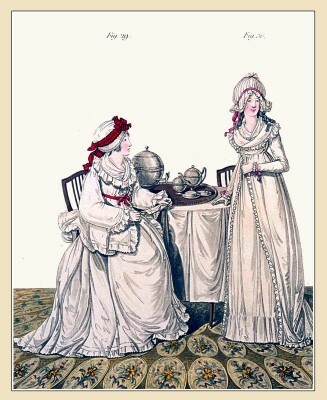 Duke of York’s night cap of dear muslin, the plaits drawn together at the top, and trimmed with a narrow lace, the whole tied round with a small pink riband; deep border edged with the same lace, falling carelessly round the face; a pink riband round the head, tied in a bow behind. Gown and petticoat of fine calico; the petticoat trimmed with a deep flounce of plain muslin; the gown with a capuchin cape, and long sleeves tied at the wrists with pink riband; the whole trimmed with plain muslin. Large muslin handkerchief within the gown. Red Morocco slippers. This entry was posted in 1794, 18th Century, England, Gallery of Fashion, Georgian period, Regency period and tagged England Georgian Era Fashion, Neoclassical dresses, Nikolaus von Heideloff, Regency period on 2/21/13 by world4.